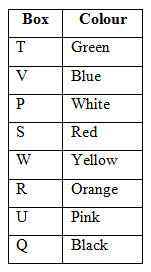 Eight boxes P, Q, R, S, T, U, V and W are in different colours viz., Pink, Blue, Black, White, Red, Green, Orange and Yellow but not necessary in the same order. The boxes are arranged one above another in a stack. The box T was not in Orange colour. 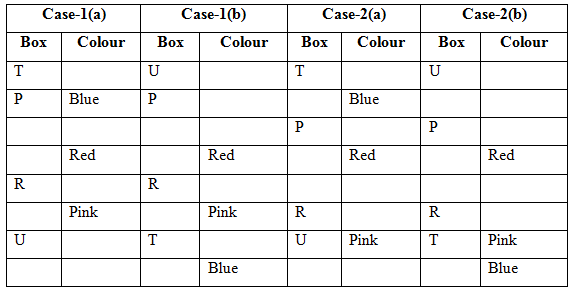 Three boxes are kept between the box P and the Pink coloured box, none of the boxes were kept at either the bottommost or the topmost position. The box R is kept immediately above the Pink coloured box. The Blue coloured box is kept immediately below the box T. As many boxes are kept above the Blue coloured box is same as below the box U. 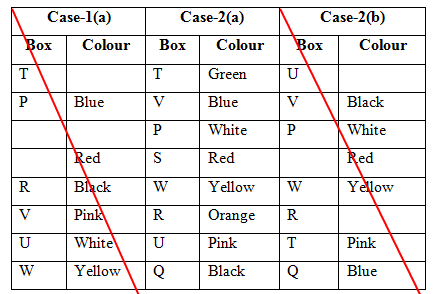 Only two boxes are kept between the box U and the Red coloured box. The Black coloured box does not kept immediately above or below the box R. The White coloured box is kept immediately below the box V. More than three boxes are kept between the White coloured box and the box Q. The box Q was not in Blue colour. The box P does not kept below the Pink coloured box. The box W is in Yellow colour and two boxes are kept between the Black coloured box and the box W.
1. How many boxes are kept between the box T and the Yellow coloured box? 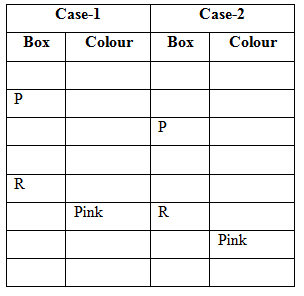 Three boxes are kept between the box P and the Pink coloured box, none of the boxes were kept at either the bottommost or the topmost position. The box P does not kept below the Pink coloured box. The box R is kept immediately above the Pink coloured box. The Blue coloured box is kept immediately below the box T. As many boxes are kept above the Blue coloured box is same as below the box U. 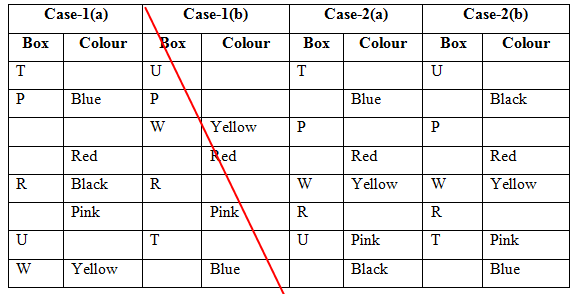 Only two boxes are kept between the box U and the Red coloured box. The box W is in Yellow colour and two boxes are kept between the Black coloured box and the box W. The Black coloured box does not kept immediately above or below the box R.
The White coloured box is kept immediately below the box V. More than three boxes are kept between the White coloured box and the box Q. The box Q was not in Blue colour. The box T was not in Orange colour. 2. The box S is in which of the following colours? 3. If Q is related to Green and P is related to Orange in a certain way. Then, U is related to which of the following? 6. If all the numbers and vowels are removed from the given series, then which of the following will be third to the right of fifteenth element from the right end? 7. How many such numbers are there each of which is immediately preceded by a letter and immediately followed by a symbol in the given series? 8. How many such symbols are there each of which is immediately preceded by a consonant but not immediately followed by a number in the given series? 9. If the first half of the elements are reversed then which of the following elements will be twelfth to the left of fifth element from the right end? 1) How many boxes are kept between the box T and the Yellow coloured box? 2) The box S is in which of the following colours? 3) If Q is related to Green and P is related to Orange in a certain way. Then, U is related to which of the following? 6) If all the numbers and vowels are removed from the given series, then which of the following will be third to the right of fifteenth element from the right end? 7) How many such numbers are there each of which is immediately preceded by a letter and immediately followed by a symbol in the given series? 8) How many such symbols are there each of which is immediately preceded by a consonant but not immediately followed by a number in the given series? 9) If the first half of the elements are reversed then which of the following elements will be twelfth to the left of fifth element from the right end?